Altay Mountains are located in Central Asia. This huge mountain massif falls within the territory of Mongolia, Russia, China and Kazakhstan, and extends in the southeast-northwest direction from the Gobi Desert to the west, to the Siberian plain. The highest point is Mount Belukha, reaches a record 4, 506 meters. From there spring the rivers Altay, Irtysh, Ob and Yenisei. The mountain stretches from the Altay Republic of Russia in Asia, to eastern Kazakhstan to the north of China’s Xinjiang region. Altay mountains reach to the north up to the western slopes of the Sayan Mountains. Peak Hüyten, reaches 4 374 m height and is located on the border between Russia, Mongolia and China. Mongolian Altay continues to the south and then east. Gobi Altay begins 500 km southwest of the Mongolian capital Ulaanbaatar and is widespread in the southern parts of the country. All of Altay extends about 2000 km in length. The name of the mountain comes from Turkic Altayc - "Al" means gold, and "tau" mountain. Mongolians call this great land formation Altayn nuruu, which again means "mountains of gold." Altay region is an important natural center of the planet, with biodiversity of animal and plant species. Most of them are endemic, rare and endangered and this Asian alpine zone offers excellent conditions for life. In Altay is where you can still see the snow leopard and Siberian ibex. 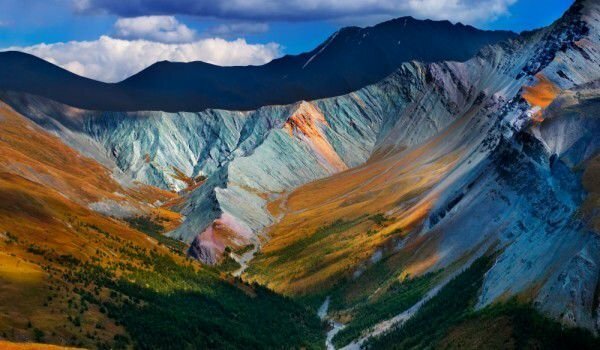 Under the name "Golden Mountains of Altay" falls a vast area of mountains, totaling 16, 178 square kilometers, which is included in the list of World Heritage sites by UNESCO. Under the protection of the world organization are natural reserves Altay Katun, Lake Teletskoye, near the peak is the Ukok Plateau. In these reserves Altay offers an incredible variety of steppes, forest-steppes, mixed forests, subalpine vegetation and alpine vegetation. In the Altay Mountains is formed the fourth largest river in the world. Ob River starts from the merger of the currents of Biya and Katun. Biya River originates from Lake Teletskoye and starts from the Belluno glacier with a length of 700 km. The river Ob in western Siberia flows as the longest river estuary in the world. 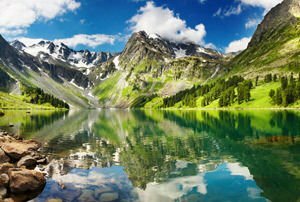 The long territories of Altay Mountains are a favorite area for lovers of nature tourism. On this vast area in the Altay is accommodated an incredible number of natural beauties. Eastern slopes of the hill are one of the most remote from civilized places in Altay, but still attract people to the reverent nature. Here you can see many mountain lakes, eternal snow, colorful carpets of alpine flowers and clean rivers. Views of the Apshagachskim lakes are inspiring - a chain of mountain lakes surrounded by snowy peaks.